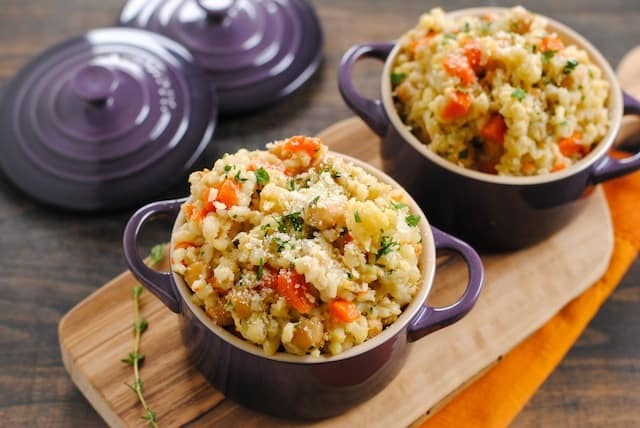 Slow cooked grains packed with chickpeas, cauliflower and vegetables. 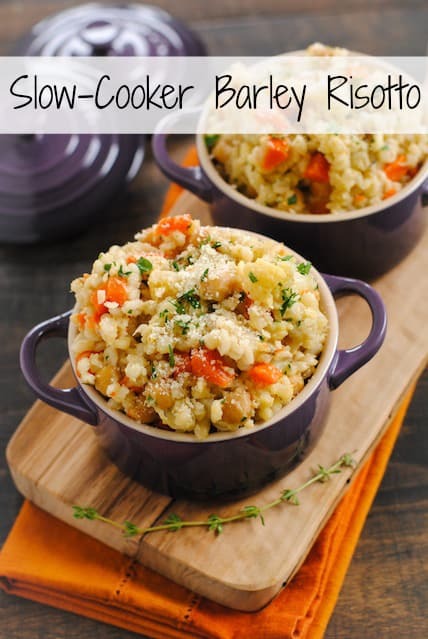 Your slow cooker does all the work for you in this Slow Cooker Barley & Chickpea Risotto! Once I realized that the risotto cooking method works for just about any grain, I haven’t been able to stop making grain risottos for dinner. I’ve conquered steel-cut oat risotto and farro and kale risotto. The time had come to let my slow cooker do some of the work with this Slow Cooker Barley & Chickpea Risotto. 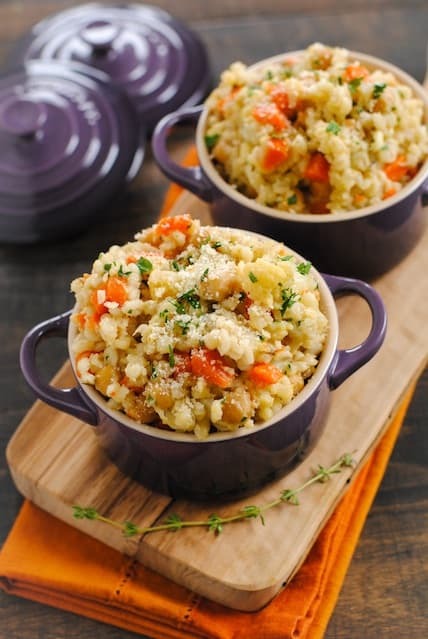 This Slow Cooker Barley & Chickpea Risotto isn’t a traditional slow-cooker recipe that you can set and forget for eight hours. Barley only takes about two hours to cook using this method. So while you can’t leave for work all day, you can leave for a few errands. Or clean your house. Or relax on the couch and drink a big ol’ glass of wine. Just stir some stuff into your slow cooker bowl as soon as you get home from work (or better yet, prep it and refrigerate it the night before! 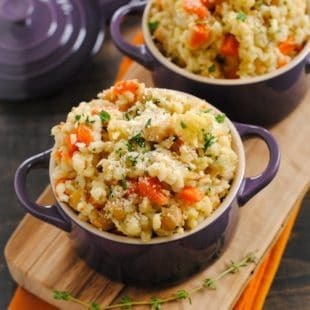 ), and in two hours, a big pot of barley, carrot, cauliflower and chickpea risotto will be waiting for you! Get the Parmesan cheese out of the fridge, pour yourself [another] glass of wine, find some forks, and you’re ready for dinner. Heat oil in large saucepan over medium-high heat. Add carrots, garlic, cauliflower and onion. Cook until vegetables being to soften, about 5 minutes, stirring occasionally. Stir in thyme and barley; cook 2 minutes, stirring frequently. Transfer mixture to slow cooker bowl. Stir in garbanzo beans, broth, water, salt and pepper. Cook on high 2 to 2-1/2 hours or until barley is tender and most liquid is absorbed. Remove and discard thyme sprigs; stir in lemon juice. Serve in warm bowls garnished with cheese and parsley.